Though the country has made a good economic progress over the years, urban experts think its capital city still lacks quality bus fleets matching people's improved lifestyle. They said almost all the existing 8,000 public buses in the city are completely unfit for running in a capital city like Dhaka and those should be replaced with high quality and standard and comfortable ones working out a comprehensive phase-out plan like the one that replaced thousands of two-stroke auto-rickshaws with CNG-run ones in 2003. Noted urban expert and former chairman of the University Grants Commission (UGC) Prof Nazrul Islam, Buet's Accident Research Institute (ARI) director Prof Moazzem Hossain, Buet's Urban and Regional Planning department Prof Dr Sarwar Jahan and urban expert and architect Iqbal Habib came up with the observations while talking to UNB. Prof Nazrul Islam said the buses in the capital must have acceptable standards. "The existing bus services in Dhaka are far below the minimum standard. We must ensure quality and comfortable and passenger-friendly bus services to reduce people's dependence on private vehicles." As Dhaka is a densely populated city, the urban expert thinks, double-decker buses are very effective here to solve transport crisis and ensure the optimum use of the existing roads. Besides, Nazrul said, the government must bring the buses under five-six franchises by rationalising the existing routes as soon as possible. "The bus management system will improve once the vehicles come under limited franchises." Citing a government survey, Iqbal Habib said, around 6,900 buses were there in Dhaka city in 2017. "Most of these buses are not suitable to run in the city. Only around 2,600 buses can be overhauled and upgraded while the rest are totally unfit for the capital city. It's government survey finding, not my opinion." He said late Mayor of Dhaka North City Corporation (DNCC) Annisul Huq had taken a step to procure 3,000 modern and standard buses for Dhaka as part of a plan to phase out the unfit ones. "After his death, the process has got stuck." Habib, also a joint secretary of Bangladesh Poribesh Andolon, said the government should give the bus owners tax-free facilities and soft loan to procure high-quality buses to replace the current ones. "It's possible as we've a successful example of removing auto-rickshaws from the capital city in 2003. So, we'll be able to replace the sub-standard buses with high-quality ones if a proper step is taken." He said city buses should be suitable for the use of children, elderly, physically-challenged people and women. "The current bus fleets are not friendly ones to all passengers." Besides, Habib said, the government should take steps for the better use of rail and waterways to make Dhaka a safe and moveable city and reduce pressure on roads. Moazzem Hossain said it is not only the fact that most buses in Dhaka are unfit but also the drivers are ineligible for plying vehicles here. "Every resident of the capital city deserves far better bus services in Dhaka than the existing ones. It's peculiar that over 200 bus companies are in an unholy competition of doing business in a megacity like Dhaka. Why air-conditioned buses are not available for passengers here? Why does a human-hauler like Leguna still runs in the capital?" he questioned. Hossain, also a professor of Buet's civil engineering department, thinks high quality buses, skilled and disciplined drivers, better city transport management, and introduction of "bus route franchising system and modernisation of bus terminals" are necessary to improve the standard of bus services in Dhaka. To remove unholy competition by buses for passengers, he said, it is necessary to design a well-networked bus routes extending to all possible areas (with franchising) and improve the frequency of buses and ticketing system. Dr Sarwar Jahan said the existing buses in Dhaka cannot be allowed to operate in the capital of a country which is becoming middle-income one. He said the government should make effective plans with suggestions from experts in the relevant field for replacing the existing bus fleets with modern and standard ones after introducing a franchising system. "Considering people's economic condition, there can be different categories of buses. But, all the buses should have minimum standard to ply the streets of a capital city...the transport system in Dhaka suffers for lack of vision, not for money," Sarwar said. The urban expert thinks dedicated lanes for exclusive bus travel by implementing the Bus Rapid Transit (BRT) is very urgent for improving the bus service. 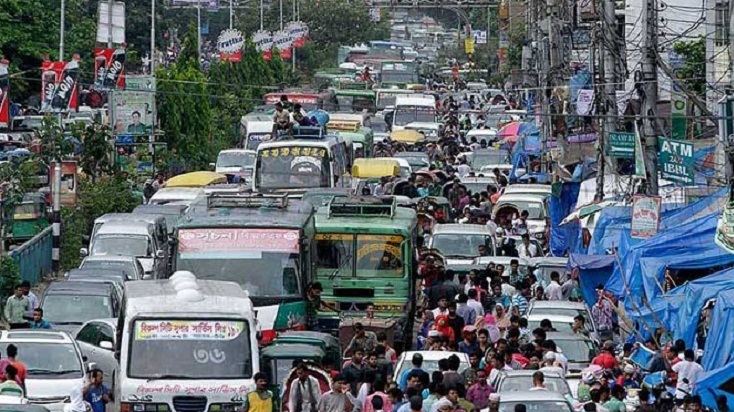 As Dhaka lacks sufficient roads, the policymakers should encourage mass transports instead of public vehicles on the streets. "We need to control the use of private vehicles and expand public transport fleet buses and double-decker ones. It's been proved as a very effective measure in many cities like London and Moscow."